A stunning quality IP64 rated nautical outdoor wall lantern constructed from antique copper finished cast brass, with a braced wall fixing mount and upward facing storm caged lantern. A secondary inner ribbed clear glass domed shade completes the nautical design. 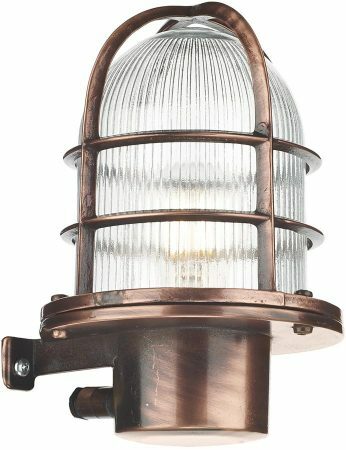 Please note that this outdoor wall lantern takes a 20w lamp and is best suited as a marker light. If you require it to be brighter then please use a compact spiral fluorescent or LED lamp. An elegant choice for the house entrance that is IP64 rated and capable of accepting an energy efficient LED light bulb to help reduce operation costs. Designed in the UK and made in the EU by David Hunt Lighting and complete with a 2 year manufacturers guarantee against corrosion.